Anyone who meets the Eligibility Criteria in the Model Participation Rules (MPR)can join the PEXA network. The MPR requires an applicant to have an ABN, be a Person (including body corporate) or partnership, be of good character and meet the Insurance Rules[IL2] .Lawyers and conveyancers can register online. The Participation Agreement (PA) is a contract between PEXA and each of the network members. It includes obligations concerning privacy, confidentiality, liability, suspension, termination, insurance, disputes and change management. It also includes our Service Charter, Pricing Policy, Security Policy, the terms and conditions governing Financial Settlement and a commitment to comply with the Model Participation Rules (MPR), as outlined by the ARNECC. The persons who execute the PA are required to have their identity verified face-to-face. This Verification of Identity (VOI) can be completed either directly with PEXA, through a PEXA Sponsor or with one of our VOI agents (you can visit a participating Australia Post outlet, or use ZipID or IDSecure’s ‘come to you’ service). VOIs help to maintain the integrity and security of the network. Your Digital Certificate enables you to electronically sign documents safely and securely. When you sign a document with your Digital Certificate, the data is encrypted. The receiving computer then checks the data to verify its integrity and make sure it wasn’t altered in transit. PEXA will help you to obtain a Digital Certificate as part of your registration. ​You can also order additional PEXA Digital Certificates if needed, click here to download and fill out the form. The PEXA Digital Signing Certificate Pricing Guide can be found here. 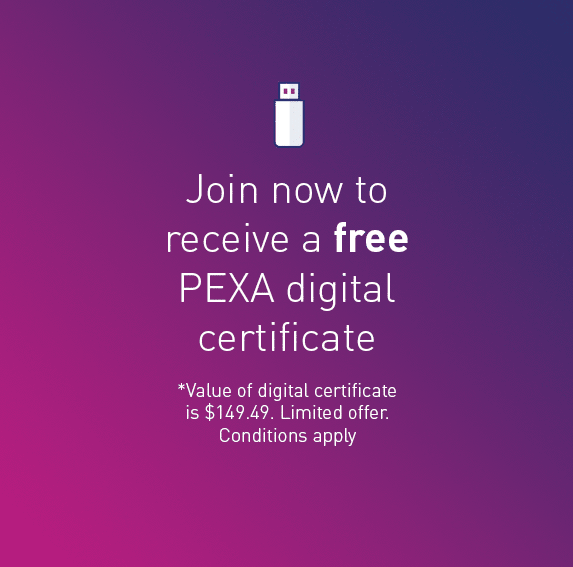 *Offer only available to Subscribers who have submitted a complete PEXA Participation Agreement and PEXA Digital Certificate Subscriber Agreement (along with any necessary supporting documents). Offer limited to one Digital Certificate per Subscriber. Offer applies only to: the first 500 Digital Certificates issued in New South Wales; the first 250 Digital Certificates issued in Queensland; the first 500 Digital Certificates issued in Victoria and the first 250 Digital Certificates issued in Western Australia. Offer not available to Representative Subscribers who have received a Symantec Digital Certificate paid for by PEXA. Offer applies to the initial certificate term only, Digital Certificate renewals charged at the published rate. In 2011, Australia’s six states and the Northern Territory set the regulatory framework for national electronic conveyancing by entering into an Intergovernmental Agreement (IGA) known as the Electronic Conveyancing National Law Agreement. The Electronic Conveyancing National Law (ECNL) governs the operation of e-Conveyancing in Australia. Each state and territory implements the ECNL by separate legislation. In accordance with the ECNL, the registrar in each jurisdiction has declared operating requirements and participation rules based on the Model Operating Requirements (MOR) and Model Participation Rules (MPR) developed by ARNECC. ARNECC regulates PEXA’s compliance with the Model Operating Requirements (MOR) in accordance with the Electronic Conveyancing National Law (ECNL). PEXA is Australia’s only authorised Electronic Lodgement Network Operator (ELNO).